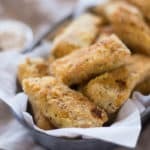 These salmon fish sticks are the best homemade fish sticks I’ve ever had and go great with the lemon dill greek yogurt dipping sauce! This easy recipe is paleo, gluten-free, clean, kid-approved, and so delicious! My kids love fish sticks. So much so that they beg us to keep frozen fish sticks in the freezer on hand for them. As much as I appreciate the convenience of having something easy they can all agree on and love, I always feel annoyed I’m serving them processed foods when I grab that bag out of the freezer. While I look for the best quality fish sticks I can find at the store, there’s just something that doesn’t sit right with me. I mean…if I wouldn’t eat them, why would I let my kids eat them, ya know? We all would probably love SALMON fish sticks! I realized I should try making homemade salmon fish sticks so everyone would be happy. Heck – we could even freeze them for an added convenience later! Perfect! Are Salmon Fish Sticks Healthy? First things first: Are fish sticks healthy? As with most things, my usual response is that it depends. Not all fish sticks are created equal by any means. Many store-bought fish sticks are breaded in refined breadcrumbs and then deep-fried, making them woefully unhealthy. That being said, eating fish in any regard is a great thing for your family, though the fish typically used in store-bought fish sticks is either cod or pollock which don’t contain quite the same omega-3 fats as — say — salmon. 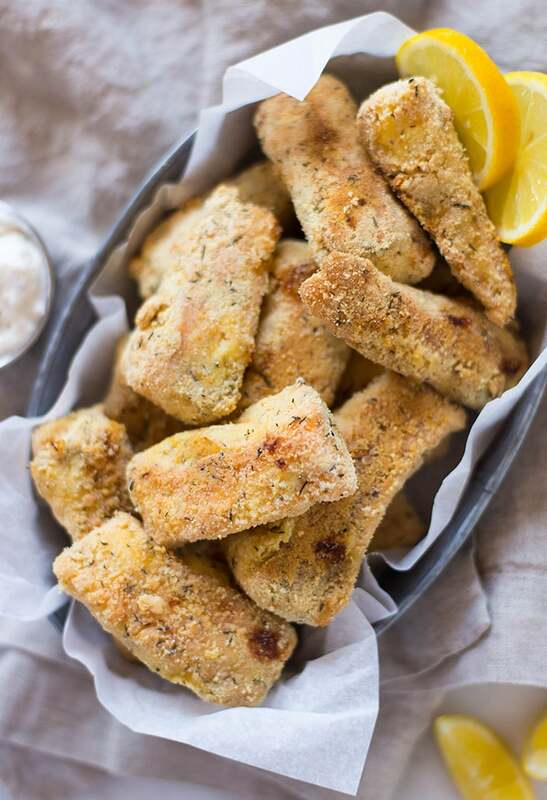 All in all, these homemade salmon fish sticks pack a lot of healthy fats and protein into a fish stick you can feel good about serving your kiddos and yourself. Instead of frying these salmon fish sticks, I chose to bake them so that we didn’t have to use any extra oil. Guys, I learned it’s shockingly easy to make homemade fish sticks. 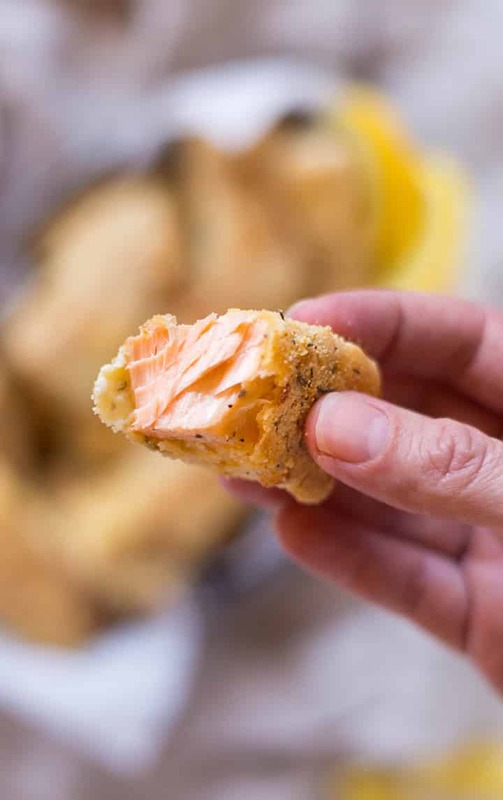 Making your own homemade salmon fish sticks not only allows you to control the ingredients, it’s also a great way to get the kids involved in making their food, too! What’s The Best Sauce To Go With Fish Sticks? Now, I should start out by noting I love tartar sauce. 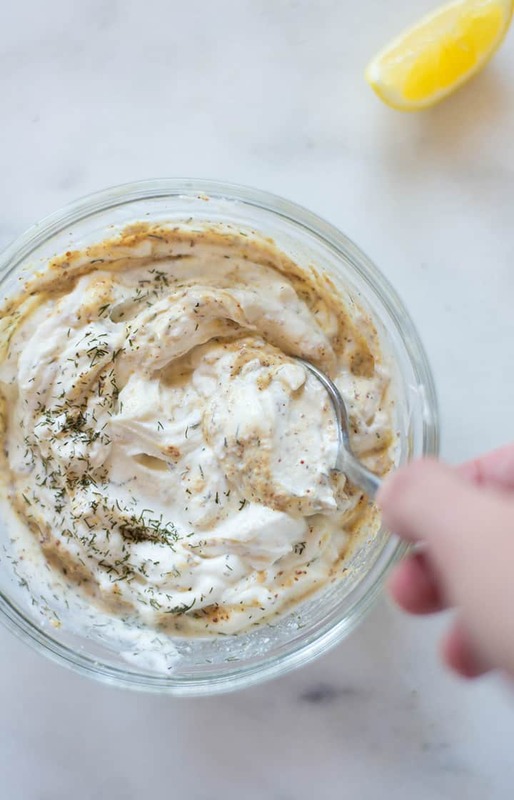 There’s just something so satisfying about the combination of that mayo, vinegar, pickles, and spices. And, while that would be a great option for these fish sticks, I have an EVEN BETTER fish stick dipping sauce to share with you for these babies. 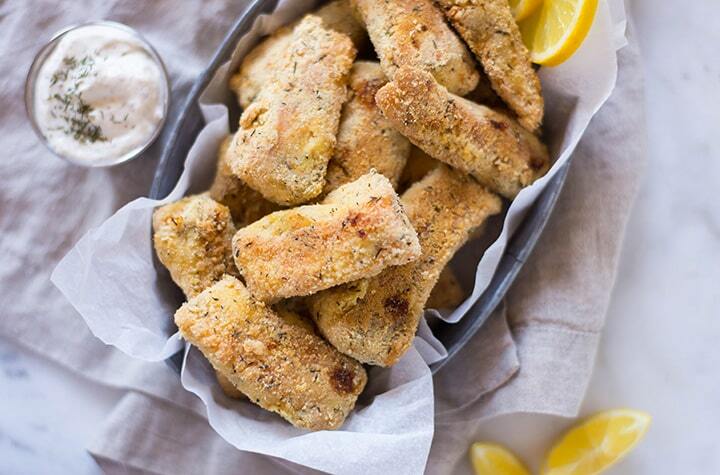 I combined greek yogurt with lemon, dill, dijon mustard, and a few spices and the flavor combo was absolutely perfect for these salmon fish sticks. Trust me when I say you won’t be able to stop eating these fish sticks and dipping sauce. Yum! If your kiddos still want some ketchup to go with their meal, I recommend this homemade ketchup recipe that doesn’t contain any refined sugars. 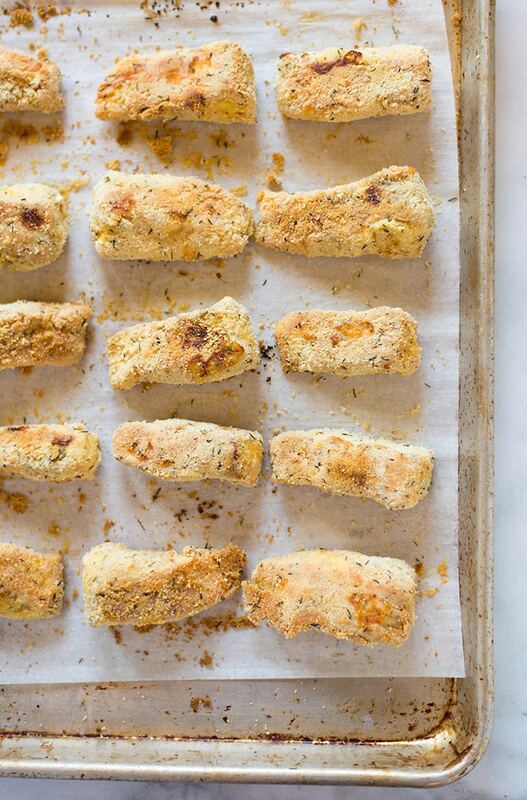 If, somehow, you manage not to devour all these salmon fish sticks after they’re cool enough to eat from the oven, here are the best ways to store them so you can enjoy them later. To store extra fish sticks in the refrigerator, place the baked sticks into an airtight container in the fridge. When you’re ready to reheat them, you can either heat in the microwave for 1 minute (which will make them not as crispy) or reheat in the oven at 400 degrees F. for 4-6 minutes, until heated through. Fish sticks can be stored in the refrigerator for up to 4 days. To freeze your fish sticks, arrange the baked fish sticks on a baking sheet and place into the freezer for 1-2 hours to fully harden. Then, gather the frozen fish sticks together and place them into a freezer-safe bag or container. Frozen fish sticks can be stored up to one month. To reheat frozen fish sticks, preheat your oven to 400 degrees F, lay the frozen sticks on a baking sheet, and heat for 10-12 minutes or until heated through. What other pre-packaged foods do you feed your kids (or yourself!) that you’d rather have homemade? Share in the comments below! For the coating, you'll need three bowls. In one large bowl, combine the almond meal, garlic powder, and dried thyme. In a second shallow bowl, add the chickpea flour. In a third bowl, add the beaten eggs. Make sure the skin has been removed from the fish. Then, cut the fillet of salmon into 2-inch wide by 3-inch long slices to make the sticks. 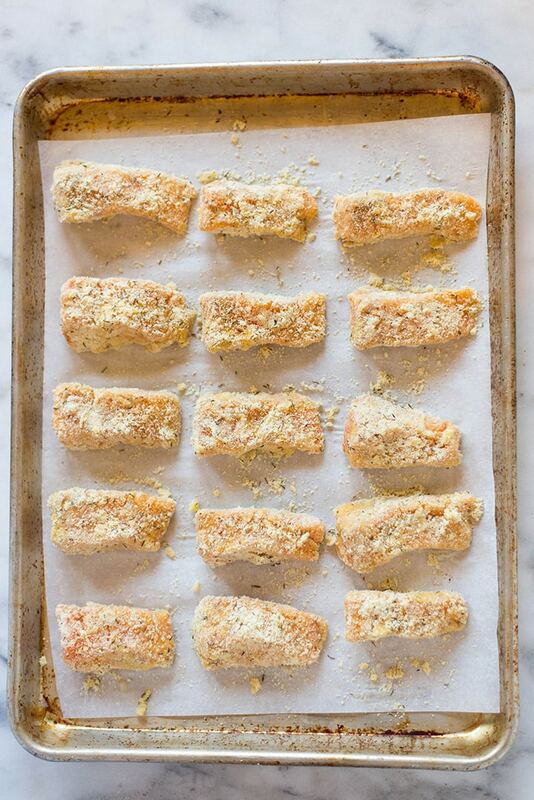 Season the salmon sticks with the sea salt and pepper. 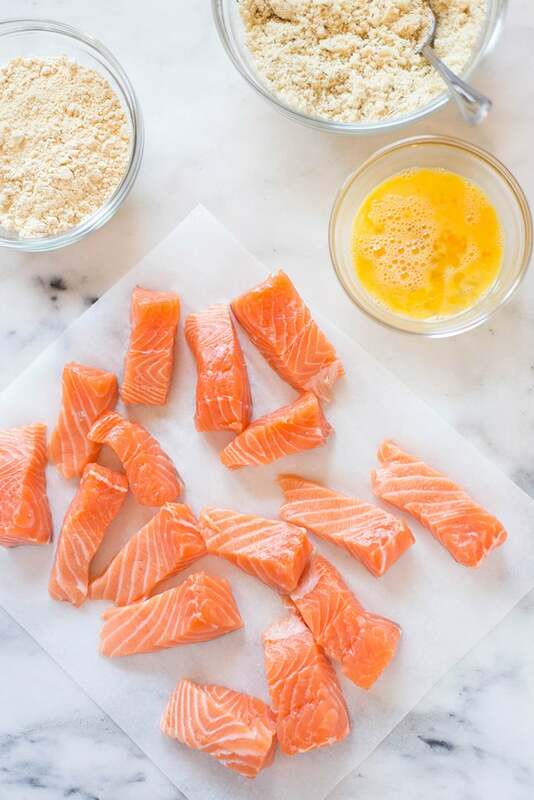 Dredge each salmon piece in the chickpea flour to coat completely. Then, dip into the egg, followed by the almond meal mixture. It is helpful to use one hand for the wet dipping and one hand for the dry dipping so your fingers don't also get coated. Place the salmon bites on the prepared baking sheet and bake 16-18 minutes, or until the salmon is cooked through. Flip half-way through baking. While the fish is baking, prepare the fish stick dipping sauce by combining all the ingredients in a large mixing bowl and stirring together. Nutritional information does not include dipping sauce. Hi, Lacey these look so good and I must say I am the grown kid in the family, the only kid in the family that likes fish sticks. However I never buy them because I have to keep an healthy diet and when I could… eat them neither my kids nor husband would eat them. So I put on the brakes long ago. But we all will like these and they look absolutely scruptious. I am serving mine with baked sweet potato rounds that I slice and toss in olive oil and bake at 400 degress and a tossed salad, yes this will be a great Friday stay at home meal. Thanks so much can’t wait. Where has everybody else found chickpea flour and almond flour? I am going to cook these babies up tonight and throw this into my Friday night rotation. Thank you so much!!! Woot woot! I hope you love them! !